The scene is London where workmen discover a pit with skulls and skeletons as they are building an extension to the subway system. Dr. Mathew Roney (JAMES DONALD) and his assistant Barbara Judd (BARBARA SHELLEY), of the Natural History Museum, visit the site. Further digging uncovers a strange space ship, thought at first to be some kind of bomb. 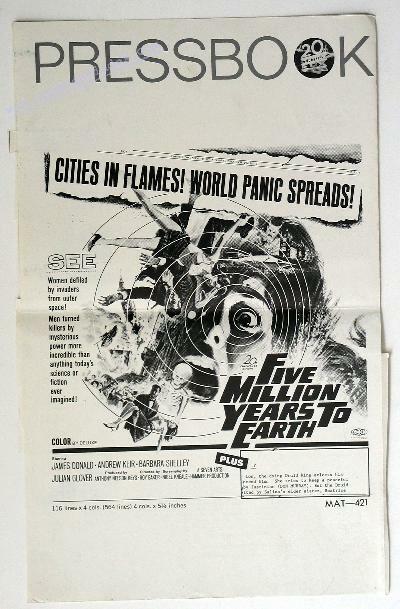 Hearing of this, Col. Breen (JULIAN CLOVER), who was discussing rockets and research with Professor Quatermass (ANDREW KEIR), decides the two should see for themselves. As his investigations go deeper, Quatermass becomes alarmed, but he cannot stop the efforts to open the missile. He realizes the danger for mankind and in his desperate search for the answer he is faced by the very Devil himself, a huge horned creature containing all the forces of Evil. Director of Photography .......................... Arthur Grant, B.S.C. Special Effects .......................... Bowie Films Ltd.